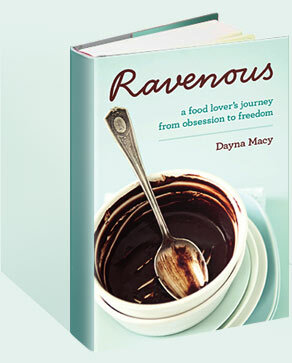 2016 May — Dayna Macy, author of "Ravenous"
When I published Ravenous five years ago, I wanted to document my journey of losing weight and making peace with my body. I examined the difference between real and processed food, I visited farms,I cooked with a Zen chef. I did a 4 a.m. yoga practice given to me by an Ayurvedic practitioner and yoga teacher. I was trying to figure out why the simple notion of “eat when you’re hungry, stop when you’re satisfied”, was so difficult. It’s true. I now comfortably weigh 25 pounds less than when I began writing Ravenous. I am healthier, my knees no longer hurt, I feel lighter inside and out. I’ve learned through observation which behaviors make it more likely I will stay in my set point range, and which won’t. Eating real food (especially lots of veggies), ditching processed food, drinking enough water, moving my body, spending time in nature — all these help keep my weight in my set range. Eating sugar doesn’t. It throws my hunger cues off wack. Amen to that. A healthier body matters because you need vitality to live a good life — one that is beyond obsession with food, a size, or a number. Life is bigger than that. Time time to live it.